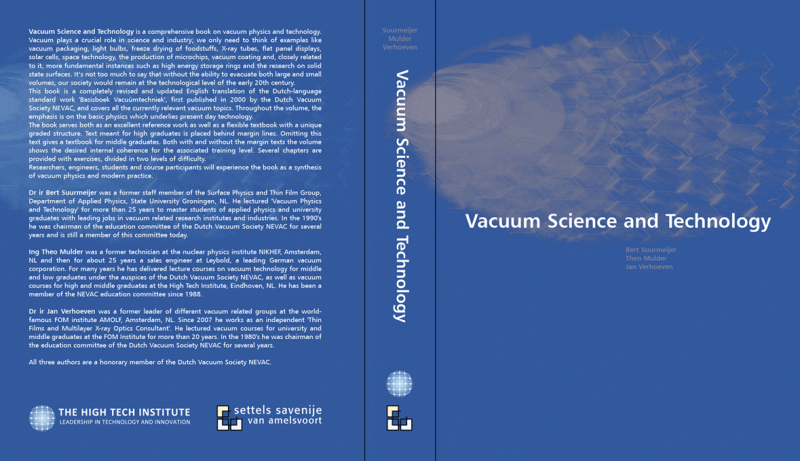 2016-02-29 In February 2016, the book Vacuum Science and Technology is published by Settels Savenije van Amelsvoort in cooperation with The High Tech Institute. This book is a completely renewed international version of the Dutch standard work Basisboek Vacuümtechniek. In this edition, in English, dr. ir. Bert Suurmeijer, ing. Theo Mulder and dr. ir. Jan Verhoeven bring together under one cover, all the relevant knowledge and updates for anyone who works in the research, instrumentation, development or production of vacuum technology. Included by the authors are important updates regarding vacuum pumps, pressure measurement, ion sources, leak detection and cleaning, and working discipline. You can order this book via the website: www.hightechinstitute.nl.